After reading Echo by Pam Munoz Ryan, I began checking out one children’s book after another by this talented Latino writer. The consistency of quality has been amazing. Each children’s book I’ve read so far is well written, has a beautiful message, and gently opens children to social justice issues. What better way for children to become true citizens of the world than by reading honestly written books about serious issues. In this children’s book, we have a direct encounter with the lives of Mexican immigrant farmworkers during the depression. While the family in this story is not a migrant working family, we also encounter the migrant workers and their plight. This children’s book does not hold back the truth of the injustices that many immigrants faced upon arriving in their new homeland. Yet the points are made without rancor or bitterness, and are simply given as facts. One of the elements that makes this children’s book unique is that it is based on fact. The author’s grandmother is the model for the character in the story called Esperanza. The grandmother indeed came from a wealthy position in Mexico to become a farm worker in the USA. We can empathize with the difficult transition it must be for a young child to go from ‘princess’ to ‘peasant’ in a blink of an eye. I love the way this children’s book presents the inner moral development of a child attempting a new life. There is a lot to learn from reading stories like this. 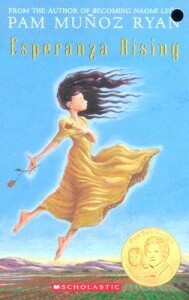 I recommend the book for any age over 9, and it can serve as a text for a classroom as well. I particularly hope that children of a Latino background who don’t know the stories of their grandparents could read this.